Did Syrian President Bashar al-Assad's motorcade come under rebel attack as it headed to a Damascus mosque yesterday? Did the Katyusha and mortar rounds fired in the direction of the motorcade hit their target? 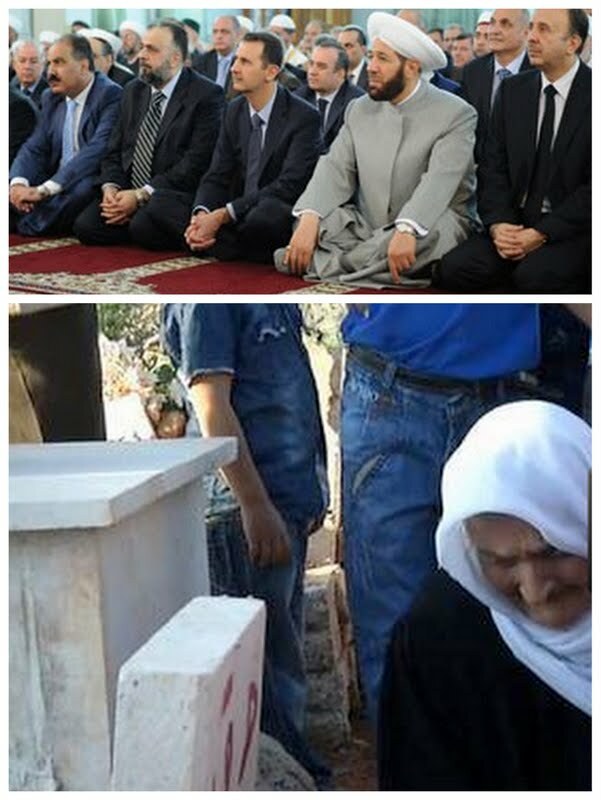 Did Assad seem perturbed while performing Eid al-Fitr prayers after his arrival at the mosque? Was the attack a pointer to the state of play on the battlefield? Syria's information minister denied rebel claims that they attacked Assad's convoy as it headed towards the Anas bin Malek mosque in the Maliki area, where the president has a residence. Opposition activists and residents reported what seemed to be the sound of several incoming mortar explosions in the early morning. The Eid prayers, which hardly take five minutes and are usually held shortly after sunrise, started an hour late at 8 a.m. It was unclear whether the pictures of the president aired on Syrian state TV were pre-recorded, analysts at BBC Monitoring said. For a brief moment they carried a “live” caption, which then swiftly vanished. It is possible the footage was pre-recorded, analysts told BBC News, as reports that the president's convoy was struck while travelling to the mosque had come around one hour previously. Two Syrian rebel brigades claimed responsibility for the attack – Liwa’ a-Islam commanded by Zahran Alloush and Liwa’ Tahrir al-Sham. Having watched TV footage of Assad praying, Dr. Zahran Alloush, a Jordanian psychologist based in Amman, later told Aljazeera the Syrian president’s “body language was telling. He looked rattled and worried. The armed opposition formed the “Front to Liberate Damascus” a fortnight ago and has started moving from Eastern Ghouta to the capital proper. Within two weeks, we’re seeing clashes in Umawiyeen and Abbasiyeen squares, which are just over two kilometers from the site of the (motorcade) incident. This means the armed opposition is now fighting inside Damascus. At the same time, the regime is capitalizing on its airpower to bomb Qaboun, Jobar, Barza, Ghouta and other places in the Damascus countryside. The armed opposition, in other words, has gone a long way since the regime announced in mid-April that it was winning the battle for Damascus. The area targeted by the rebels today is a nerve center for the regime. It’s where the presidential offices and palaces are. Although Katyusha and mortar rounds are not exactly accurate, I think the message was delivered to the regime: the president’s motorcade is on our radar. We’re now into what is called fourth-generation warfare (4GW), in which no side lets its opponent rest. For example, after capturing Minnigh airbase in Syria’s far north, we see the rebels targeting political and military regime leaders in the heart of Damascus. The purpose is to keep the adversary under tactical, operational and strategic pressure. On August 1, the president paid a symbolic visit to troops in the battered town of Darayya, southwest of Damascus, on the occasion of Army Day. TV footage showed him surrounded by scores of presidential guards and exchanging a few words with 10 soldiers at most. Why would a head of state need special protection when talking to his troops? The answer came today in the capital’s Maliki area. Also on August 1, the rebels sent a wave of rockets slamming into a huge advanced weapons depot in Wadi ad-Dahab, southeast of Homs. How did the rebels know it existed? A day later, they captured a major munition depot of anti-tank guided missiles in the Damascus northern countryside region of Qalamoun, where the Syrian army’s famed 3rd Armored Division is deployed. Who led them to it? Then came the armed opposition’s sweep on Latakia’s rural areas, where they captured 10 villages in two days. This tells me, the armed opposition is now getting a trove of intelligence information from regime insiders.